On a busy Saturday night, Ran somehow managed to score on all of the above. 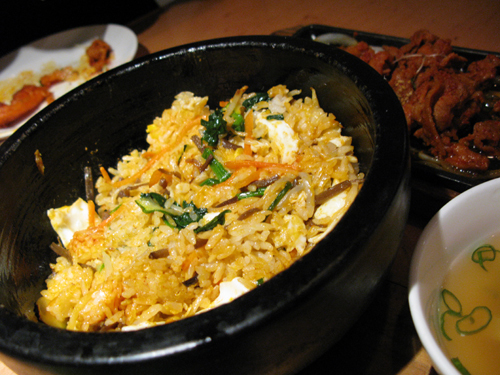 Don’t get me wrong though… I absolutely love Korean food. 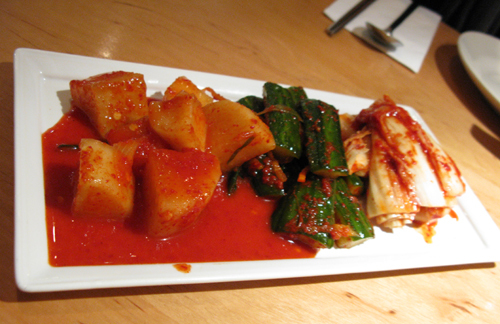 I love the sharp flavours, the tender, flavoursome bbq meats, the striking red colours of kimchi and spicy pork bulgogi. Putting aside the long wait, neglected booking, and unwarned surcharges, the food at Ran is average at best. Most of the staple Korean classics are decent bar a few air-balls that seem to miss the point completely. 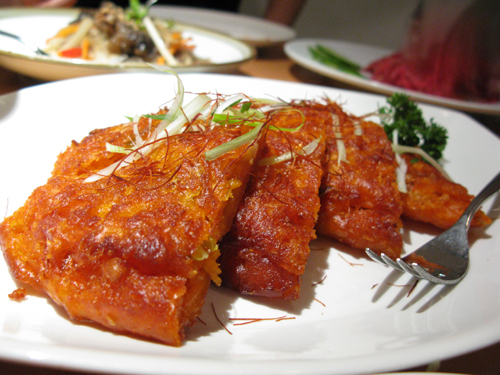 The sour experience continued with our starter of Kimchi Chun – a Korean pancake with a twist. This kimchified version was much too sour and the usually crisp texture which distinguishes the famed Korean pancake was instead water-logged by the wetness of the kimchi. I’d suggest sticking to the classic Pa-Jeon pancake which is loaded with seafood, vegetables and scallions only (had it here on another occasion and it was a much better, balanced dish). Thankfully, our other starters were pretty decent and up to standard. 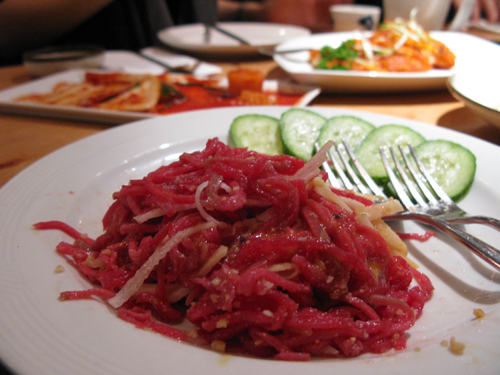 My favourite Korean dish of Yuk Whey (beef tartare with nashi pear and raw egg) was on the money. The raw beef was as it should be – fresh, ice-cold and full of meaty flavour. The pear was delicate and not overly dominating the way it is in some other places. Please put aside any fears of e.coli or madcow…when binded together with the egg-yolk, this cold dish served up raw is an absolute treat. 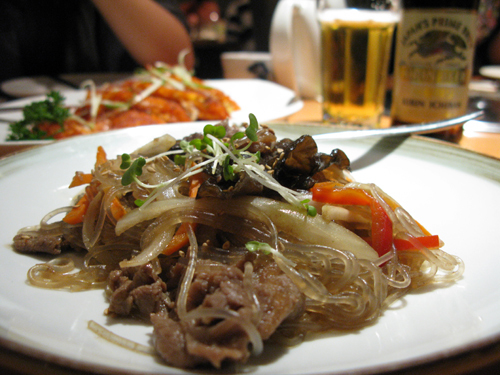 Our other staple starter of Chap Chae (glass noodles with beef), was also faultless – balanced and well seasoned, with the right amount of spring in the glass noodles. There was nothing wrong with the Bulgogi itself. The pork was tender and full of flavour, probably testament to a long marinade and a belly cut with a good fat content. It was the condiments to go with the BBQ that I had a problem with. While most places usually serve these on the house, they had the nerve to charge £2.50 for 6 pretty ordinary lettuce leaves and a further £1.75 for spring onion in an “aroma” (they forgot to serve the latter altogether). Robbery I tell you. Total damage for the night = £61 quid. In fairness to Ran, we ordered a fair bit for 2, but you could get the same easily, if not better for under £50 at the likes of Woo Jung or Arang. I know many people who put Ran at the top of their list for good Korean, but I don’t think I’ll be making a Saturday night booking anytime soon at my own choosing.